Desserts often remain on the back foot when it comes to out-door cooking; blame it all to the limited techniques and ingredients while camping. In such cases, our dessert indulgence mostly remains restricted to toasting marshmallows over campfire or popping in few packaged sweets to satisfy any sudden sweet craving. But why should you deprive the sweet tooth from its sugary pleasures when whipping up a simple camping dessert is possible! 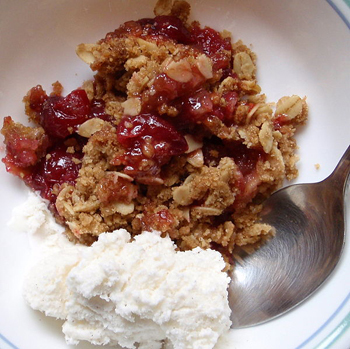 To begin with, make apple and cranberry crisp and turn your camping party into super fun! This classic dessert calls for simple ingredients, is easy to make and doesn’t make you wait for hours. This off shoot from the cobbler family of desserts features tender apples spiked with a hint of cinnamon-y goodness and teamed up with a crunchy, sweet-buttery oat topping – an age old combination that can never go wrong. The cranberry crush revs up the fruity flavors further and will surely earn you some rave reviews. Though authentically a baked goodie, this cookout version of apple crisp turns out equally well when cooked over campfire. All you need is a Dutch oven, fresh apples as well as cranberries from the local markets, a handful of the listed ingredients and only 45 minutes of your time to make apple crisp and save your co-campers from the monotonous desserts. Arrange the apple slices half way within a Dutch oven and scatter the cranberries on top. Toss rest of the ingredients together until well combined and spread it on top of the fruits. Place a lid on top and cook the dessert over the campfire for 45 minutes or until the fruits soften.